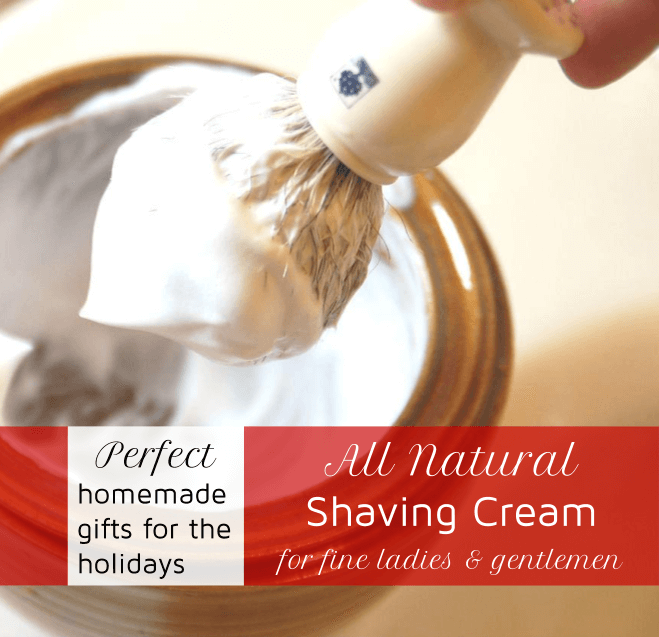 This amazing homemade shaving cream with natural lubricants and essential oils improves razor glide for a close, comfortable shave and will leave skin silky smooth and moisturized. Makes a perfect homemade gift for men and women alike. Oh, and don’t forget to make a jar for yourself ;-). Melaleuca (Tea Tree) essential oil has strong cleansing properties. Research has shown Melaleuca to be effective against acne. Peppermint works great for toning the skin and prevents clogging of pores. Sandalwood essential oils is great for softening the skin, relieve itching, and to clear complexion. Place all ingredients except for essential oils in double boiler (or glass bowl in a larger pot with about an inch of boiling water). Stir until melted. Let shaving cream rest until hard (can be put in the refrigerator to speed up the cooling process).